... or on standard cardbacks. 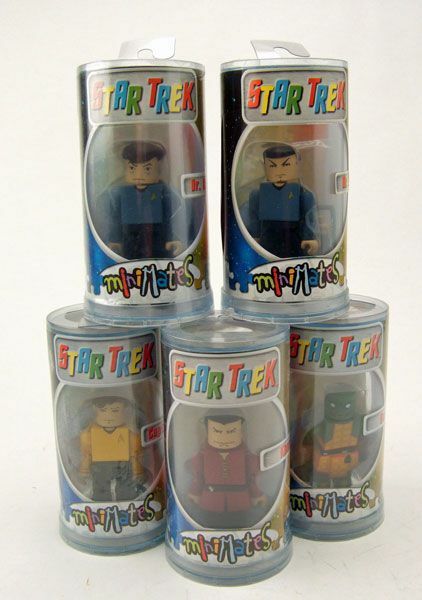 The "Trouble With Tribbles" Kirk was only available in the carded packaging. And it looks like I've managed to lose my carded McCoy as well. The original Minimates from Art Asylum were based on a slightly larger scale, with figures clocking in at 3" instead of the now standard 2". While the larger size made sense for individual figure releases, the block figure concept doesn't really work when the figures are this big. The simplified detailing just looks better on the slightly smaller 2" scale. 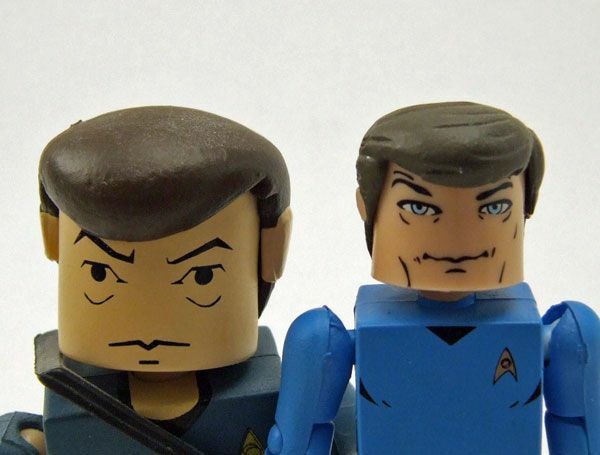 Take a look at the difference in the McCoy likenesses here. Part of the reason the smaller McCoy looks so much better in his 2" version is due to improvements in Art Asylum's work over the years, but I feel part of it is due to the scale as well. Those simple features look a little ridiculous blown up like that, but might be just fine shrunk down to 2" scale. It's not just the faces on these that look a little primitive either. 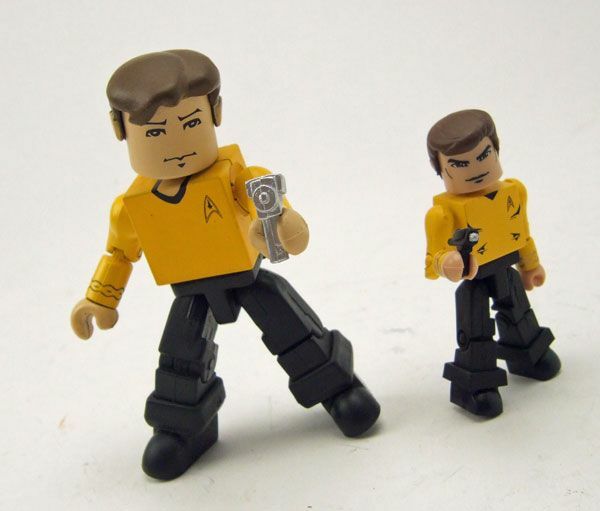 As evidenced by the "casual" Kirk comparison above, the costume detailing is almost non-existent on these early minimates. It's weird to see how much is crammed into the little guys, while these larger guys look almost unfinished. And it's like that pretty much across the entire wave. Let's take a look at each of 'em! Kirk is featured in his standard "gold" shirt, which is a no-brainer for the first release of the good captain. 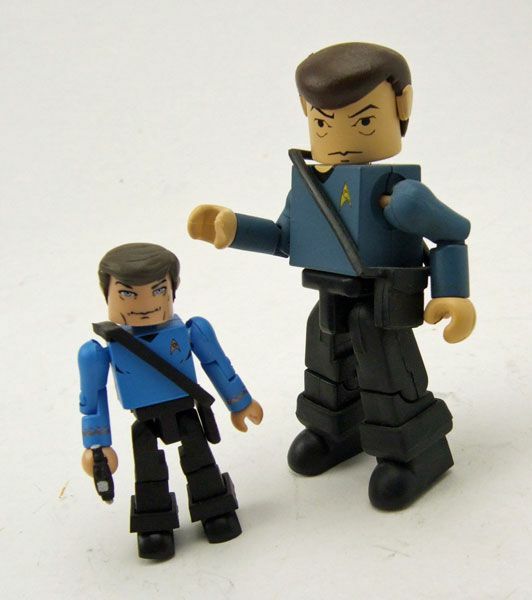 Kirk's likeness is just about on par with his 2" counterpart, but that's mostly because the smaller version is one of the least accurate of that scale. The fact that his delta shield isn't even painted gold (it just uses the yellow of his shirt with a stenciled outline) is a big no-no though. 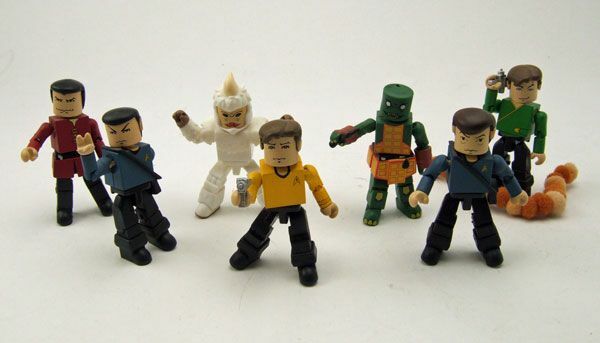 Kirk comes equipped with his trusty hand phaser... Oh, and before I forget, each of the 3" minimates came with an odd Art Asylum puzzle piece thing. It wasn't really a base, since there weren't any peg holes or anything; They were just weird, useless plastic puzzle pieces... So I threw them in a box somewhere and forgot about them (thus why it isn't pictured). Next we have Dr. McCoy. 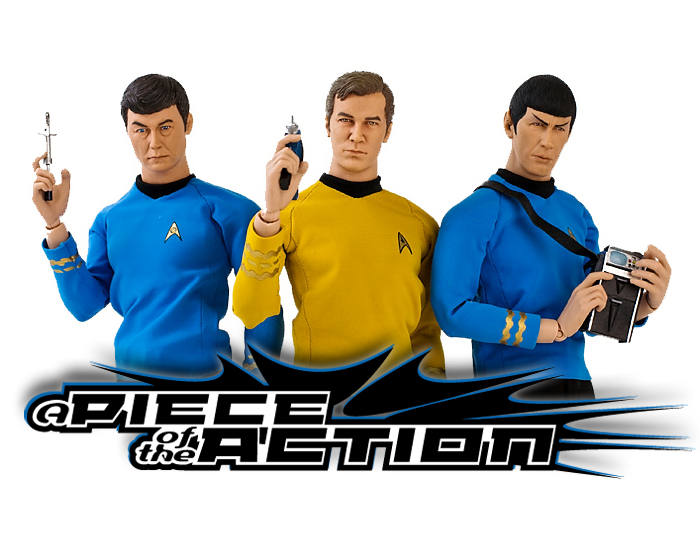 The blue of the shirt used with both Dr. McCoy and Spock is a little on the dark side for my tastes. Other than that, Bones isn't too bad, though his likeness is a bit easier to capture due to the "character" in De Kelley's face. McCoy comes equipped with a tricorder. 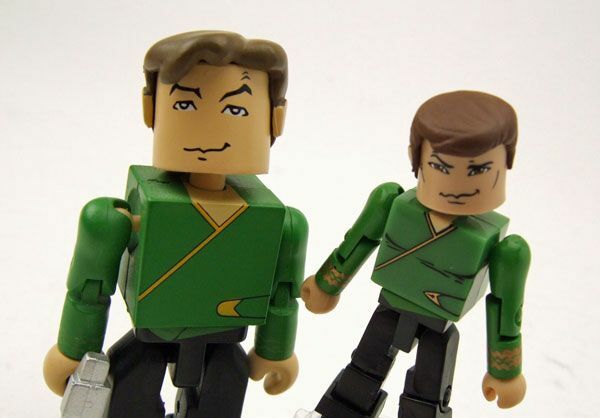 Again, we see how the detailing improved when the decision was made to shrink down the minimates. 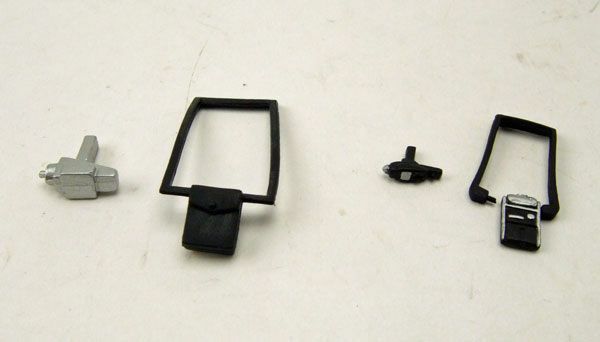 These original 3" scale accessories lack even the most basic detailing when compared to their smaller brethren. To combat our three intrepid heroes, Art Asylum included a trio of dastardly villains in this initial wave. Khan here has no accessories and comes in a very odd outfit choice (as opposed to the solid red later released in the 2" line). 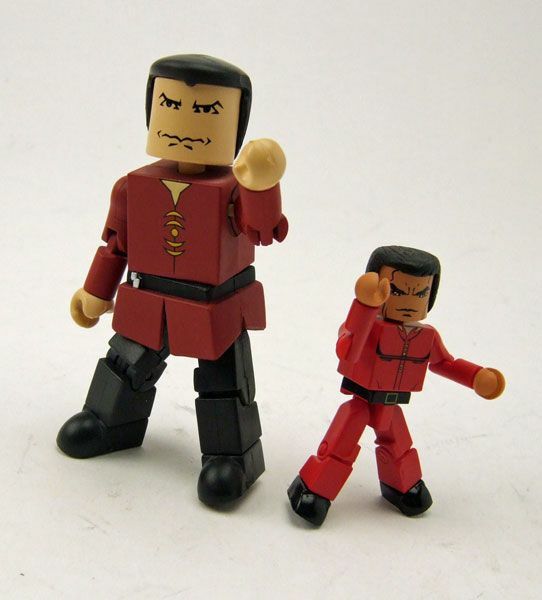 I will say this about the larger Khan though; I actually think the face looks much more like Ricardo than it does on the smaller one. He is probably the only one of the bunch that I can say that about. 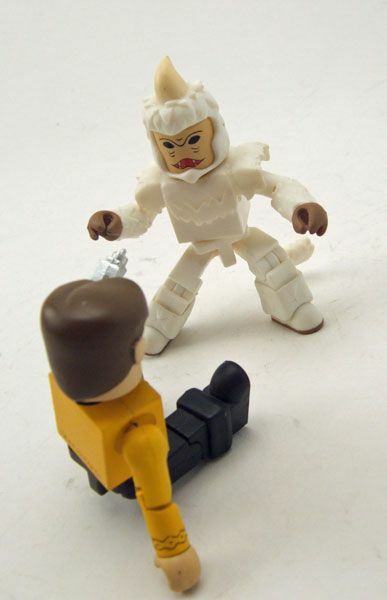 The Gorn is another obvious choice for an initial villain in any Trek line. I was pretty pleased with him when he first came out, but comparison with the 2" version brings out his shortcomings more than any of the others. The square blocks on the tunic, the painted-on attire, the weird yellow squares on the knees... It's like comparing the graphics on an Atari 2600 with those on a Sega Genesis. Hey, sweet analogy James! 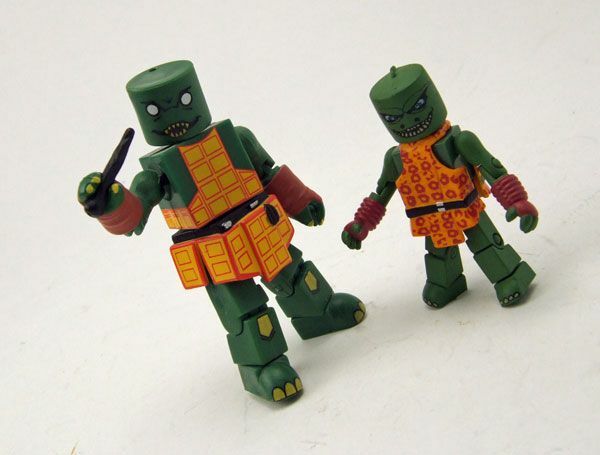 Oh... and the Gorn comes with a spike and a translator, but I dropped the translator before I took the picture. So use your imagination. Finishing out the wave is the Mugatu! 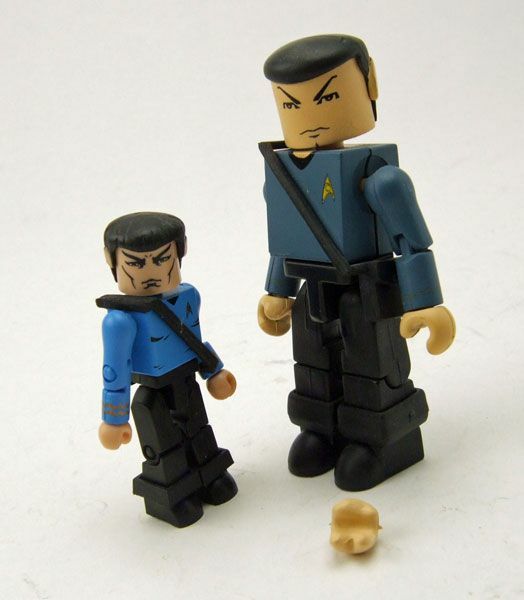 This one has the distinction of being the only 3" Trek minimate to not get a 2" counterpart... which is a really shame because he's probably the coolest release of the batch! What he lacks in accessories (he has none), he makes up for in cool sculpted parts. 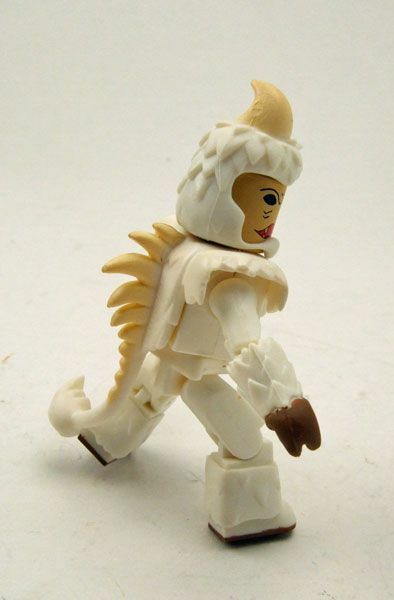 Check out those sweet back spikes! 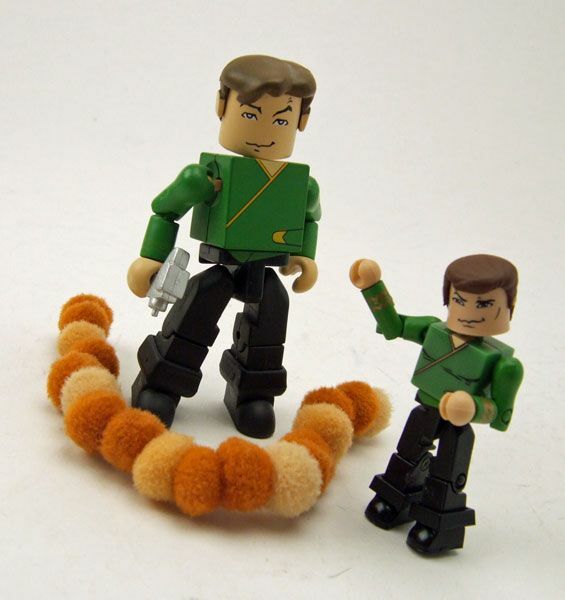 While not part of the initial wave, I'm grouping the "Trouble with Tribbles" Kirk in with this post too. 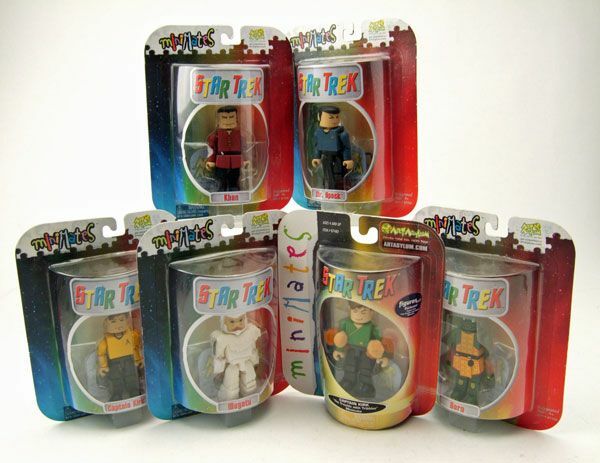 TWT Kirk was a separate exclusive release through Figures.com. He's built on the 3" body, just like the initial wave, and comes equipped with the same silver hand phaser. He also includes a bunch of fuzzy "tribbles" (basically just little colored puff balls on a string). While there's nothing very memorable about this release, I do think his cocky grin is pretty well done. And that's it for the 3" minimates. 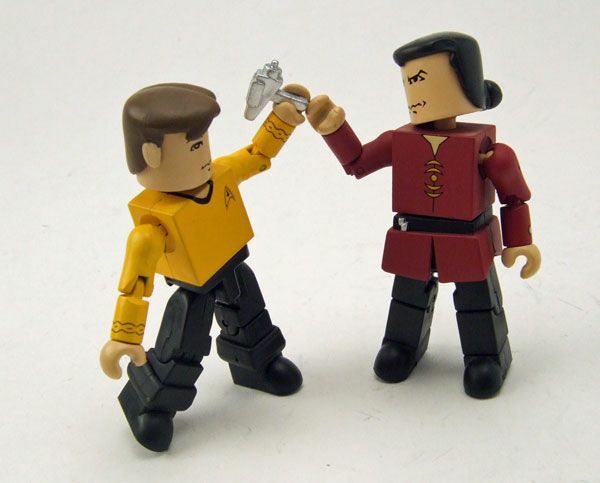 A second wave was planned that included the rest of the core crew, plus a "mirror" Kirk and a klingon... but it got the axe when the larger format was retired. With only this small grouping of figures released, there really isn't a need for most folks to pick these up. 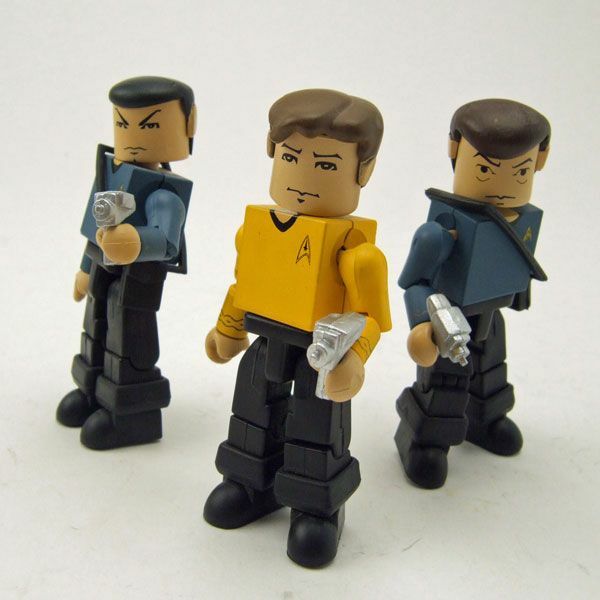 If you are interested in getting into the Trek minimate line, you're better off going with the 2" guys. The line is much more expansive, and the product is just plain better.